The purple passion flower vine (Passiflora incarnata) is a tropical vine that can easily grow up to 25 feet. The vine climbs surfaces by utilizing auxiliary tendrils. Many gardeners grow the vine along the ground or on slopes for excellent soil erosion control. The appearance of the flower petals and sepals have a wavy or crimped look. The vine produces large orange-yellow fruits that are edible. The fruits are often called "mayhop" because of the loud "pop" the fruit makes when stepped on or crushed. The purple passion vine grows widely throughout the American South from Texas to Florida. The plant spreads and propagates by root suckers and seeds. Cuttings can also be rooted. Vines are often planted on fence lines and slopes; along houses and buildings; or around trees. The vines will readily spread and grow with very little care. 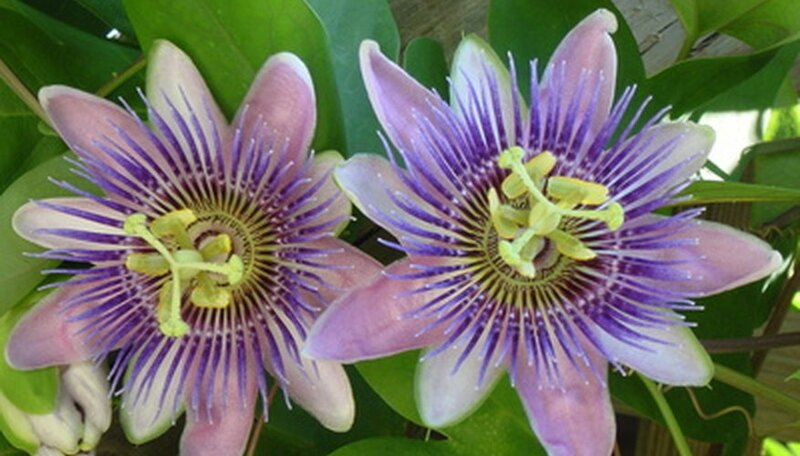 In 1620 a Jesuit priest in Peru had a vision concerning the passion flower. The vision portrayed the 10 flower petals as 10 of the disciples. His vision did not include the disciples Judas and Peter. The priest also saw the five stamens of the plant as the wounds that Christ received during the Crucifixion. The three stigmas of the plant represented the nails driven through Christ's hands and feet. The priest viewed the fringe on the flower as the crown of thorn. The planted was dubbed the "Passion" in remembrance of the Crucifixion The flowers normally measure under 2 inches in size. The vine flowers in early spring. After flowering, the fruit matures in 60 to 80 days. The purple passion vine thrives in tropical and subtropical climates. The vine can withstand a few degrees of winter frost on occasion but a severe freeze will kill the plant. The purple passion vine can withstand alkaline soil conditions but prefers an acidic soil. Purple passion vines prefer to be planted in an area that receives direct sunlight for at least four hours a day. The purple passion vine is self-fertile and can bear fruit with no other vine planted close for cross-pollination. Carpenter bees are the most effect means of fertilization for the vines. Honeybees are never as effective because of their tiny size. The honeybee also prefers other flowers over the purple passion vine flowers. The purple passion vine is relatively short lived. An average life expectancy for the vine is only three to five years. Juice is commonly made from the ripe fruits of the vine. The juice is high in ascorbic acid (vitamin C) and carotenoids (vitamin A). The fruit can also be used as a pie filling and jelly. The fruits can also be consumed raw with seeds intact. Very few pests ever bother the purple passion vine or its fruit.